As the summer season draws to a close, members of the Livestock team are thrilled to welcome an adorable new addition to the Park. Back in 2015, we welcomed ‘Rhubarb’ to the flamingo family who won the heart of many guests as she grew older week by week. On September 10th 2017, a new flamingo chick finally hatched and is a welcomed addition to the flock, taking the name ‘Custard’ to complete the classic Pick ‘n’ Mix sweet combination! We are delighted to report that at just four weeks old, the chick already roams confidently around the enclosure and paddles in the pool. Custard’s feathers should transform from white-grey in colour to a light and bright shade of pink, typically due to the usual flamingo diet. Both parents are currently feeding a bright red ‘crop milk’, which should aid the colouring of the chick’s feathers over time. As a small chick, Custard’s beak remains straighter than many other Chilean flamingos, the characteristic downturn of the beak is anticipated to occur at 10-12 weeks. 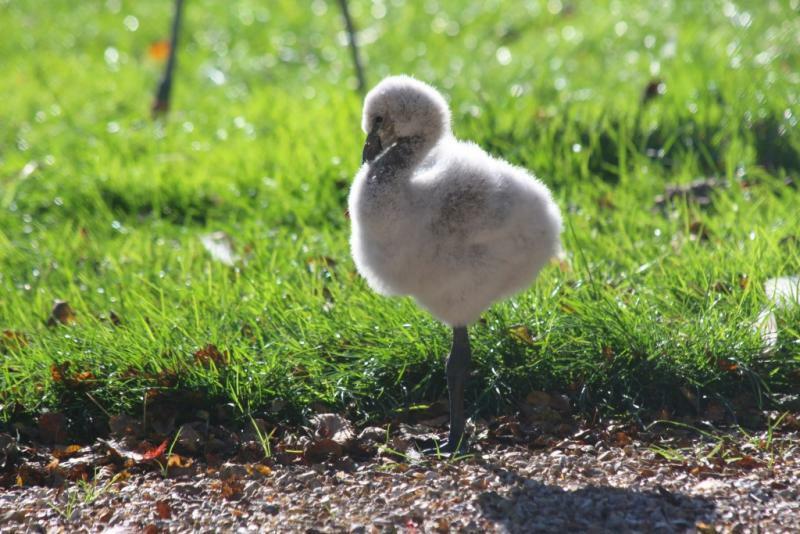 Although flamingo chicks appear very small and weigh less than 95g when hatched, it is likely that they will grow to heights of up 120cm whilst reaching more than 3kg in weight. See if you can spot our new feathered friend on your next visit.